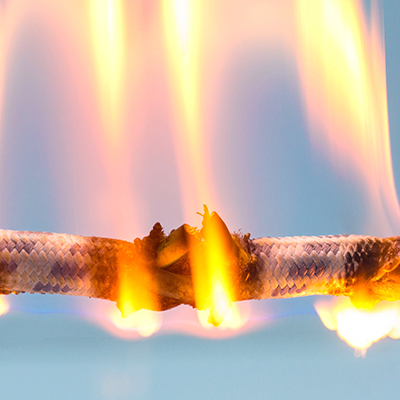 Electrical fire prevention is one of the most overlooked aspects of home safety and one of the leading causes of house fires in the United States. According to the National Fire Prevention Association in a four-year span, home electrical fires caused over $1.3 billion in damage and lead to over 400 deaths. The following tips can help you to prevent electrical fires in your home. Electrical fires are often caused by outdated electrical systems in older houses, this can be prevented by assessing the integrity of your home’s electrical system. All outlets should accept three-prong plugs and wired with solid copper so that all current should run through a circuit breaker, which trips (shuts down power) when sensing an overload. Surge protectors should be installed, either as a whole house protector to protect everything or installed to prevent power surged for a certain appliance. Avoid overloading outlets and minimize the use of outlet extenders. Extension cords should only be used as a temporary solution and not for the long-term use. In addition, extension cords should never be run under carpets or near moisture. If you suspect your electrical wiring is compromised here are a few signs that may confirm your suspicions. By looking out for these warning signs as well as following the steps to prevent electrical fires you are able to provide a safer home for you and your family. If you feel unclear about your electrical wiring ask your trusted electrician for help and recommendations.